SCHUYLER COUNTY--Home sales dropped 14.5 percent for Schuyler County in 2018 over 2017, while the median price decreased 3.8 percent. 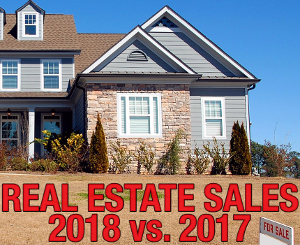 The New York Association of Realtors (NYSAR) reported the 2018 total sales for Schuyler County at 165 homes. In 2017, 193 homes were sold, a 14.5 percent decrease. The median price also decreased 3.8 percent. NYSAR reported the 2017 median price was $145,500 and the 2018 price was $140,000. Despite the drop, NYSAR said homes priced between $100,001 and $150,000 were on the market for the shortest average period of time. The agency also reported that 95.2 percent of the listing price was received for Schuyler homes. A decrease in sales matches the statewide trend. According to NYSAR, sales were down 2.5 percent across the state in 2018. However, the agency added the median price was up 6 percent overall. In comparison, 2018 homes sales were down 3.6 percent in Tompkins County, down 0.7 percent in Steuben County and down 1.5 percent in Yates County. Not everything was down in Yates, though. According to the Greater Rochester Association of Realtors (GRAR), the median price for a Yates home was $169,000 in 2018. The previous year, the median price was $161,950, a 4.4 percent increase. Speaking to the second home market, Mark Malcolm, Century 21 realtor, said lake-shore and lake-view homes sales are still strong. Malcolm said inventory is down, but "usually is this time of year." "There's a reasonable amount of inventory to satiate demand," added Malcolm. "We're still very low on inventory. It's been that way for the last four years," said Dan Morse, broker/owner of Keuka Lake and Land Realty. "Village homes, lake homes, are low across the board." However, home sales and vacation rentals are not the only types of realty for the area. Morse said his agency has handled six farm sales last year, something different. He added other companies auctioned off farms as well. Morse said interest rates are another factor to consider. He explained that interest rate prices are creeping up, but are still historically low. Morse added he is seeing a return of "stated income loans," where the prospective buyer can claim they make more income than is documented. He said loans like this were part of the reason the housing market bubble previously burst. Despite the drop, the New York State Association of Realtors (NYSAR) said homes priced between $100,001 and $150,000 were on the market for the shortest average period of time. "That's definitely the case," said Morse. He explained unless the listing price was too high or there was something wrong with the home, most properties were sold before they hit the market or would have multiple offers.